Collective outrage reverberated from the heart of San Francisco’s Mission District and across the country when a hail of media coverage descended on what one Silicon Valley import had to say about the homeless people share his neighborhood. Justin Keller, who is colloquially referred to as the ‘tech bro,’ is the founder of the start-up Commando.io. After living in San Francisco for three short years, he wrote an open letter to Mayor Ed Lee demanding that the homeless were moved out of his neighborhood so he does not have to “see the pain, struggle, and despair of homeless people” going to and from work. This letter comes amid one of the most aggressive periods of gentrification and mass displacement for San Francisco residents as property values and rents in previously working-class areas of the city have skyrocketed, replacing the established population with highly paid tech workers from well-funded start-ups and social media giants like Twitter. Though Maria owns her home in San Jose, she has an additional ten tenants renting space in their small three-bedroom house. Another cafeteria worker reported that he was living in the living room of a co-worker’s apartment, while she shared the one bedroom with her three children. This group of workers are currently employed with Guckenheimer Corporate Dining and went public with their organizing drive on February 10that a public rally, demanding that Intel CEO Brian Krzanich support the contracted employees as if they were Intel direct hires. Wages have been a key sticking point that led to the campaign, with many workers publicly citing the local housing market as the driving expense to be met. In a recent survey of 30 of the Guckenheimer workers done by Unite Here, the median wage was $14.50/hr, which, according to the MIT Living Wage Calculator, is about half of what a living wage would be for a single parent in the area. A delegation went forward on February 25thto confront management, looking at the wages and working conditions that have stretched employees so thin. The workers were later shuffled between contracting companies, moving over from Guckenheimer to Eurest, a food-service contractor with almost 2,000 locations across the country. Eurest is only a piece of the massive Compass Group conglomerate that holds other known food service, educational, and hospitality companies such as Canteen, Bon Appetit, and Flik. Workers report that the move to Eurest only increased tensions, with some employees alleging that their first paychecks once Eurest took hold were missing worked hours. These allegations ranged from just a couple of hours all the way to a few days or a complete work week. Many new hires say that they have been unclear what their starting wage is, building on the uncertainty that is happening both on the shop floor and inside the organizing committee that was built when Guckenheimer was still at the helm. Unite Here has not took this situation with silence, going as far as to leaflet Intel’s presence at the South by Southwest festival. Their one-page, including an “inequality inside” spoof in the corner, paired Intel’s 2015 record for $55.9 billion in revenue with the meager wages that their cafeteria workers make. Today the committee reports union cards signed from 82% of employees in the proposed bargaining unit and right now management’s lack of response has left many workers to wonder what they have planned to undermine unionization attempts. This is not the first union push to use the collective housing issues of the area as a driving factor in organizing as labor around the country has been forced to confront the lack of livability that their membership is facing. This has been an ongoing project, with unions like the Service Employee International Union starting community-partners like We Are Oregon in the wake of Occupy Wallstreet to work on the continued post-crash wave of evictions. The dynamic of displacement has shifted in the direction of tenants, and now much of the focus for housing justice activists is on urban areas seeing a blast of desirability from a combination of job growth and cultural branding. As places like San Francisco, Portland, Brooklyn, and Seattle become less and less affordable, a shift in priorities is happening back to looking at rent control, confronting no-cause eviction, and seeing homelessness as having a key place in the struggle for economic and housing justice. 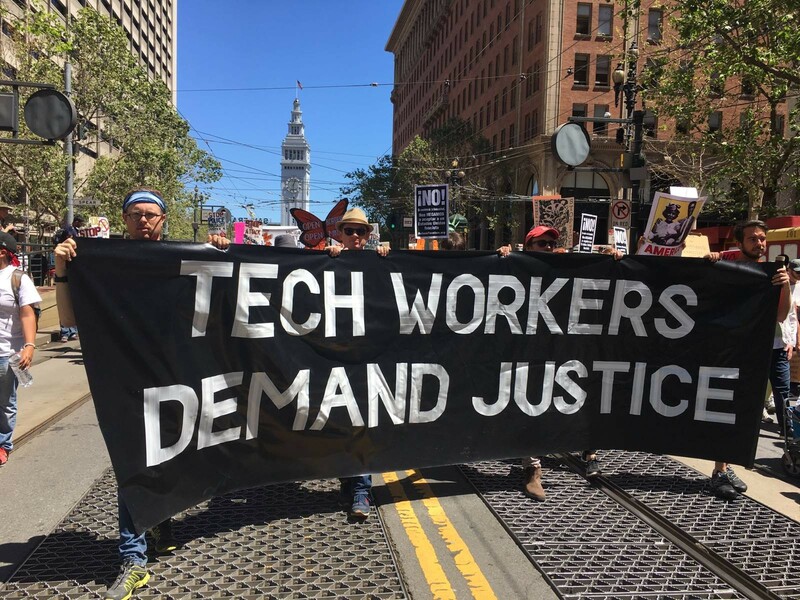 The core organizing committee in Intel’s kitchen has committed to making housing an issue in this fight, and to take those issues back into the community that is seeing a crunch inside and outside of the tech industry. They plan on returning to Keller’s neighborhood in the future to continue providing food for the homeless community of the area. In this way they hope to make their push towards unionization a tool in the larger movement that is advocating unity among organized labor and housing justice organizations.